Fourth Grade Nothing: What's Happening!! Roger, Rerun & Dwayne! What's Happening!! Roger, Rerun & Dwayne! 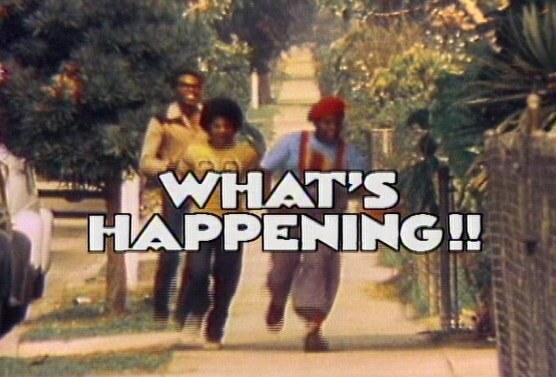 Growing up in the early 1980s, I loved the show What's Happening!! Loosely based on Cooley High, a movie focused around an urban Chicago high school in 1975, What's Happening!! was a situation comedy centered around three high school friends. Roger (Ernest Lee Thomas), Rerun (Fred Berry) and Dwayne (Heywood Nelson) kept audiences entertained with their quick wit and fun personalities. The guys often hung out at a local luncheonette, Rob's Place, where they hassled chubby, hilarious waitress, Shirley (Shirley Hemphill). Shirley didn't take any nonsense from the boys while she served up burgers, fries and shakes. Shirley took more of the spotlight later on in the series when she moved in to Roger's home to help keep an eye on Dee. The ABC show aired between August 1976 to April 1979, though I was watching reruns (no pun intended). I loved the show What's Happening!! did you? Yes, I remember watching it in it's original run. Haven't seen it in years though. What's Happening! was one of my favorites! I recently found it again on DVD and had lots of fun watching it. I'd forgotten (if I'd ever known, I was little in the early '80s) that Roger was a writer, just like I am now. Yes. LOVED IT! I started hearing the theme music when I saw this picture. My favorite scene is when Dee tells Roger, "Good speech, won't help" in reference to Roger trying to get out of punishment. I totally forgot about that show! I used to watch that after school. Dee was my favorite character. I need to get my hands on the DVDs. I didn't watch What's Happening in its original broadcast, but became a fan during reruns in the mid 80's. In the early 90's I was working for a bank in St. Louis. One of my co-workers casually mentioned she and her boyfriend had been out with Fred "Rerun" Berry over the weekend. This blew me away and I was a bit skeptical. She called him to prove it but he didn't answer the phone. That night I wrote a Top Ten Reasons Rerun Wouldn't Answer His Phone a la David Letterman. My co-worker sent him the list and he had a good laugh with it. About a year later on my wedding day, who should show up but Rerun. He stuck around for photos and signed some autographs. The photo my wife and I chose to announce our wedding in the local paper was one with Rerun standing next to us.